Mouse has read a great antique blog. Although focussed at the higher end of the market there is much of interest here. So give Newel's Antique Blog a read. Mouse is very much of the same mind as the author. Mouse has never concentrated purely on antiques. He has always been keen on modern artists and craft workers. 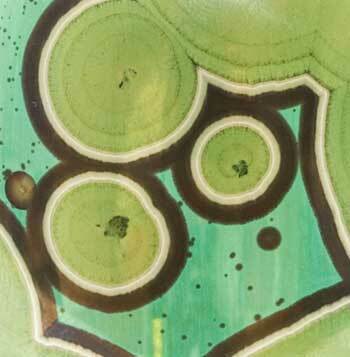 One area he especially admires is ceramics and crystalline glazes. These are stunning he has often been heard to remark. Without doubt one of the past masters of recent times is Theodore Deck. Working for Sevres, directing their output, he produced some marvellous pieces. It is now almost impossible to find his work in this area, at least at any reasonable price. 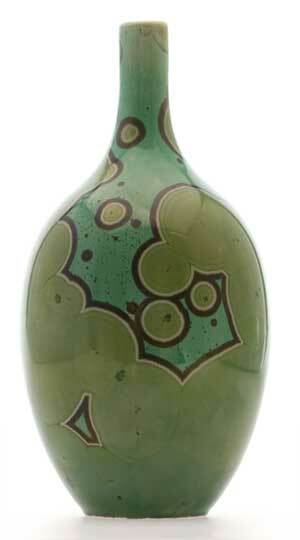 There are a number of modern exponents of this glaze in the UK. There are an interesting collection of potters in Wales and the West. Firstly, Margaret Shotton based in Bristol. An interesting point about her pieces are the form. 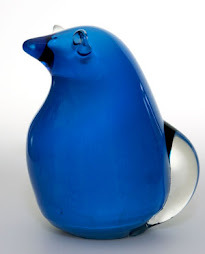 She is not inclined to stick to the more normal shapes and this makes some of her pieces especially decorative. A different approach is used by Mark and Patrizia Walford in Wales. This pottery has produced glazes with remarkably deep colour. They have also produced jewellery. Mark Walford pottery with very rich colours. In this case only a few crystals. The beauty is in the colour. Another potter from this part of the world is Avril Farley also producing rich colours. Arguably one of the most interesting of the current potters is Simon Rich based in Narbeth in Pembrokeshire. He has real fun with these glazes and throws remarkably well. 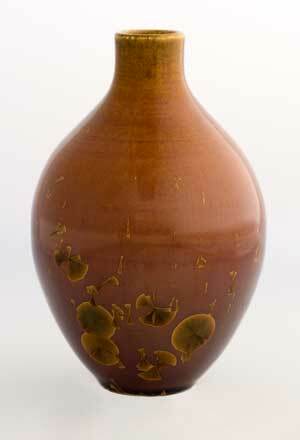 He plays games with the existing forms and styles, and this makes his pots rather special. 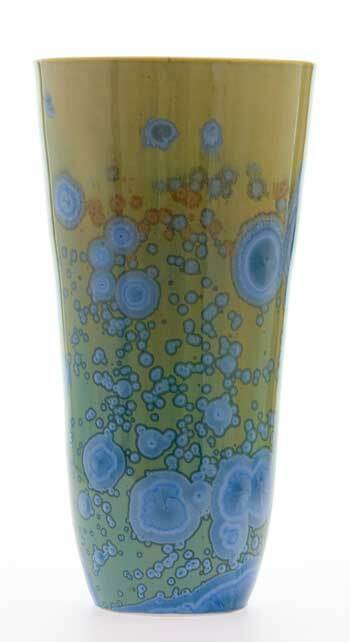 The thing about Simon is the way some of his crystal glazes do not appear like crystal glazes. An intentional deviation. 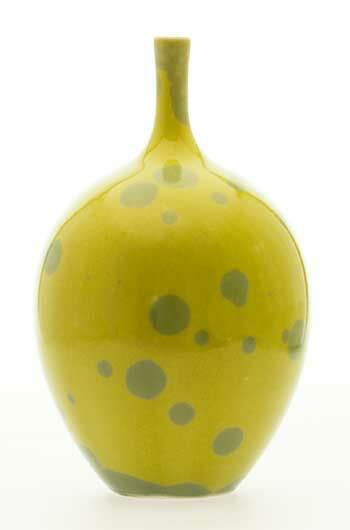 A Simon Rich vase with an almost plastic look. The white comes from introducing titanium. Simon Rich was playing with multiple colours. It has a soft silky sheen. 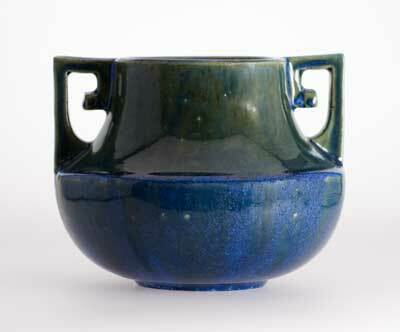 This remarkable Simon Rich pot was inspired by his mother and her love for ceramics of the 20's and 30's. 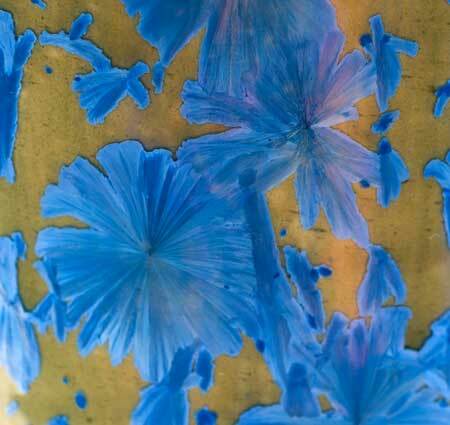 His aim was to reproduce those soft colour glazes with crystalline glazes. This is just outstanding. 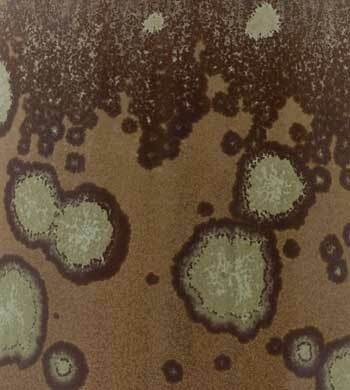 A close up of the glaze. Unbelievable! 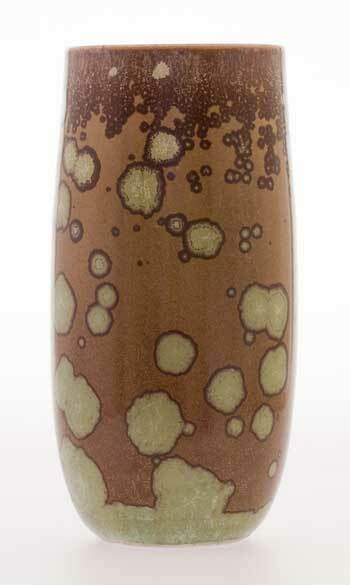 This Simon Rich vase is part of a series where he was playing with the idea of having a waterfall of small crystals behind some large ones. 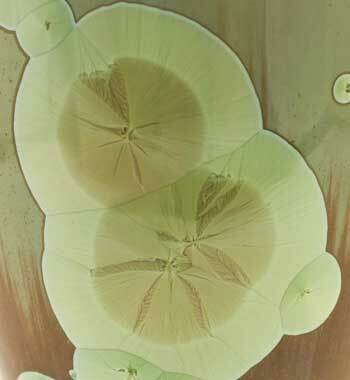 The close up of this glaze is almost fractal. This last pot is a stunner. Very difficult to photograph. 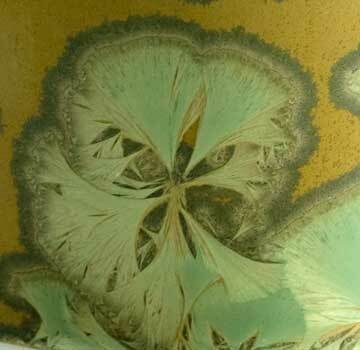 A nickel glaze not made since Deck at Sevres or before that the Chinese potters of many centuries ago. Of course Mouse thinks you may know others in this style, he would love to hear about them. The remarkable thing about all these potters is that none of their pots are expensive. There is more information here, where there are links to other potters working in the field (not all of these links are live). I cannot help but wonder whom will be remembered as greats. 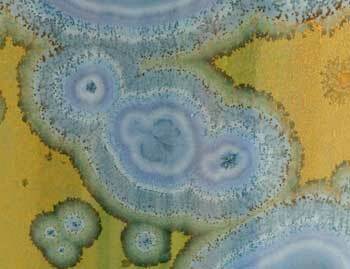 "Well, you have got to look at Simon's work, particularly when chasing down unusual metal salts for his glazes. They may not always be traditional but they are always special". They all come from a long heritage of this type of glaze. This includes masters such as Arthur Wedgwood, Howson Taylor as well as more commercial endeavours such as Fulper in the USA, basins and commercial bowls by Portmeirion. 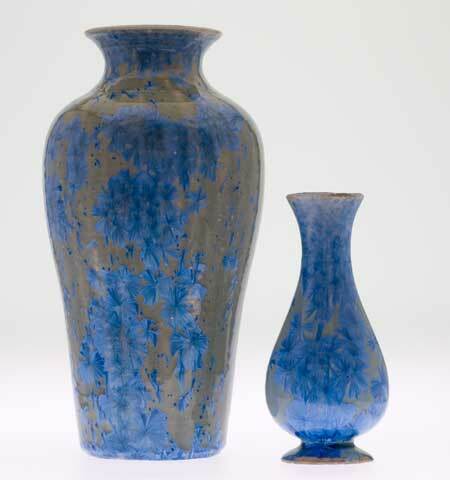 Below is a pair of vases by Arthur Wedgwood, Mouse thinks these are great fun. 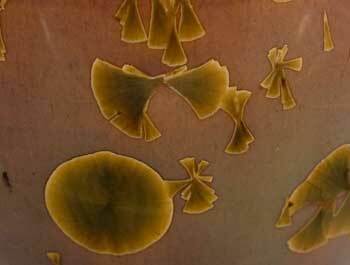 A close up of the crystals in the Arthur Wedgwood vase. 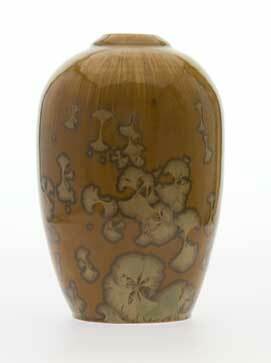 And finally a Fulper vase. It is hard to appreciate it but the lower portion of the bowl is a sea of tiny crystals. This is just an arbitrary snap shot of a few workers according to Mouse. Mouse has also said that Portmeirion Starfire bowls are his favorite as they are very convenient for holding chocolate ice cream, "Now that's what a good bowl should be used for" he remarks whistfully or is it wishfully! I see his point. The Antique Mouse is a highly respected member of the community. His interests are wide ranging, and he likes nothing better than sharing his views.